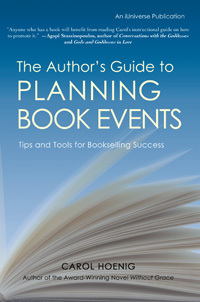 The Author’s Guide To Planning Book Events was named finalist by USA Book and Reader Views and given the Gold medal by ForeWord Magazine for Book of the Year in the category of writing. The Author’s Guide To Planning Book Events (iUniverse Star), written by award-winning author Carol Hoenig, provides an informative and entertaining look at how authors can reach their audience by doing successful events. Hoenig, having worked as a national event specialist for years for a major bookstore chain, booking authors of every caliber, offers an inside look for those who want to give their book every advantage. Hoenig also approaches the subject from the author’s point of view, since she promoted her award-winning novel Without Grace to great success. Much too often authors make the mistake of waiting until the publication date to consider booking events while also believing that the traditional venue of a bookstore is more lucrative than a nontraditional venue. Not always so, says Hoenig, who writes about her years of experience working as an events coordinator in Manhattan for a major bookstore chain, sharing humorous anecdotes about lessons she’d learned – some the hard way. She then used that knowledge when promoting her award-winning novel by doing both bookstore and nontraditional events.